For many centuries, hank dyeing is being carried out in primitive equipment in which the yarn hanks are suspended on wooden poles in a rectangular wooden vat. The sticks are moved from end to end of the vat to give some degree of agitation and at the same time the hanks are turned manually to dye the portion of hank in contact with the sticks. The system has been gradually mechanized- wood has been replaced by metal like cast iron and stainless steel. The traditional Hussong hank dyeing machine is shown in the figure. It consists of a frame carrying sticks or poles on which hanks are hung and which can be lowered by a hoist on a gantry, into the rectangular vessel containing the dye liquor. The liquor is circulated by means of a reversible impeller, which is separated from the hanks by a separator and is located at one side of the dye vessel. There is an adjustable weir at the bottom of the impeller compartment, which regulates the volume of flow. A false bottom is provided at the bottom. The holes in the grid are arranged in such a way that there are more holes at the remote end of the impeller than adjacent to it to distribute the liquor flow uniformly. The packing of the hanks should be denser at ends than in the middle as the circulation is more powerful at the ends. The impeller can be rotated in opposite directions alternatively so that the direction of liquor circulation can be reversed. 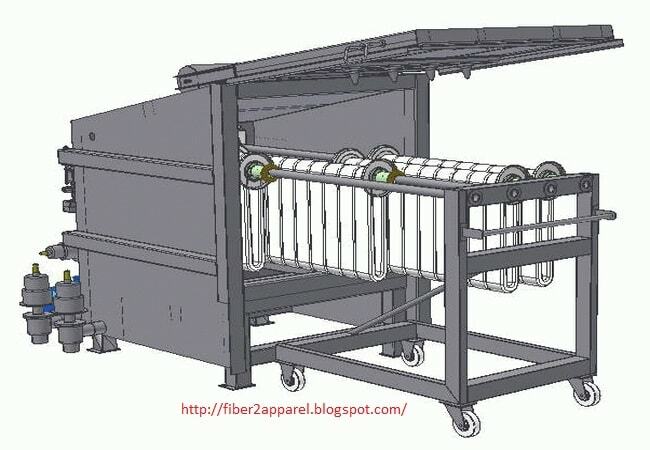 The upward direction of circulation is maintained during greater portion of the dyeing cycle. During this period, the hanks are pressed against the perforated top of the pole frame, and the liquor by penetrating through the hanks, is compelled to come into intimate contact with every part of the hank. Heating is by open or closed steam pipes, which are situated below the perforated false bottom. In modern machines, the yarn is suspended from V-shaped sticks with perforations to prevent stick marking. Even so, with some qualities, the yarn is turned on the sticks manually halfway through the dyeing or wet processing process. In one stick machine of the Hussong type, the direction of flow is mainly up through the hanks, which causes the yarn to form a dense pack, which impedes the liquor flow. This causes uneven dyeing especially with dyes of high fastness and poor leveling properties. The use of a second stick at the bottom of the hanks prevents the mass from being lifted by the flow and allows a greater rate of flow to be used without severe entanglement. In such machines, the distance between the sticks must be adjusted according to the hank length, so that the yarn is not stretched tight during dyeing with occurrence of consequent stick mark. Yarn entanglement may occur in this type of dyeing. Here, levelness may be inferior to package dyed yarn. Dyeing cost is less here. Hank reeling and back winding is costly and may generate waste.